Two of the scariest areas in startupland are healthcare and education. These are monolithic, highly regulated sectors with long sales cycles — not particularly prone to “disruption.” In this year’s Kleiner Perkins annual internet trends report, Mary Meeker argues that these two sectors might be at an inflection point. I remain sceptical. Another sector with hundreds of years of history and entrenched players is investigative journalism. 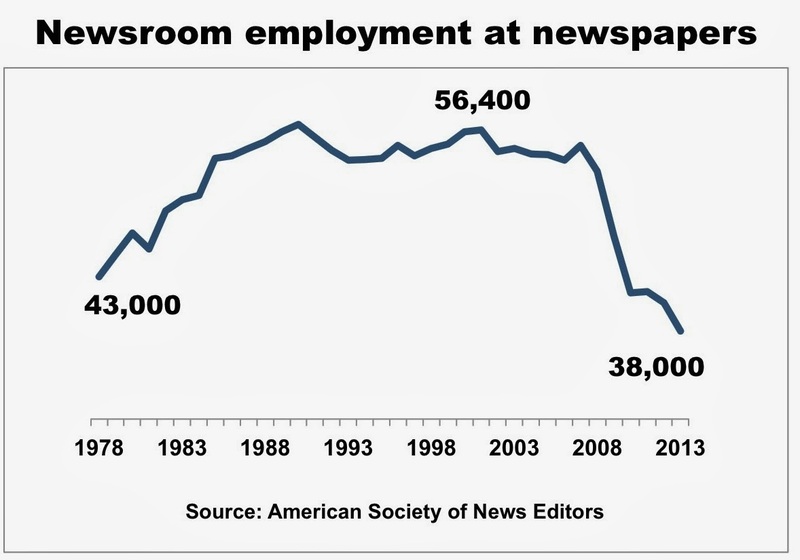 Newspapers have been struggling since their heyday in the 1980s. Revenues are down, churnalism is up, and there are less employed reporters out there chasing down leads. Something needs to change, but since most revenue still comes from print, newspapers are loth to experiment too wildly. In effect, newspapers are prisoners of their own business model. Within journalism, investigative reporting is the most difficult to produce because of the capital required and the long turn-around times involved. In our instant-gratification-mediascape, investigative journalism has fallen by the wayside. What was once a valuable service, subsidized by the the inefficiencies of bundled media empires, is now withered and cut as media behemoths look to slim down in the face of internet disintermediation. This is happening across the board of public interest content — just look at the troubles at the CBC. I don’t think it can be argued that investigative journalism should be done away with. It is a valuable institution for our democracy — the venerable Fourth Estate. (The Fifth Estate is an extension, not an evolution). Thus, with an established pain (ie. the need to know what is going on in the halls of power) and a market (ie. every citizen), the opportunity for startup disruption is obvious, non? There are certainly a lot people tackling this problem. Many are solving the problems of “information overload” (through curation) or distributed workforces (through publishing platforms) but as far as I could tell, none are focused on solving the business problem of funding long-term, quality reporting. Paywalls and online advertisements do not suffice. One solution is lots of money. Pierre Omidyar, the billionaire founder of eBay, started First Look Media with some interesting new ideas on how to fund real journalism (I encourage you to watch the video). Last year, Jeff Bezos of Amazon purchased The Washington Post. We are still unsure of how WaPo will change. I am one of the few people that is actually willing to pay for content. I have subscriptions to a few established news outlets (Foreign Affairs, Globe and Mail, The Economist etc) and I have even supported some startups in the space. I backed Matter (later acquired by Medium) which tries to solve the problem of terrible science and technology reporting. They had a community-based editorial board where members could vote for allocating commissions. Another outlet I have used in the past is Atavist. They have an interesting model in that they are a product company that commissions longer pieces to feature its platform. The non-fiction pieces can sometimes approach investigative journalism. The business model is subscriptions and micropayments, and the selling of their publishing platform Creativist. Most recently I have discovered a Canadian startup Ricochet Media. I heard about them on Jesse Brown’s Canadaland podcast. Ricochet is trying to square the circle of funding independent, investigative journalism in Canada. Like Beacon, Vourno and Contributoria they are going with a crowd-funding model. Like Matter they have a community-driven editorial process. They are trying to get off the ground by crowdfunding themselves on IndieGogo. We shall see how they do. Journalism is a “hard problem.” Some have argued that it has been failed by the market because you cannot treat citizens as consumers. Some say public-interest journalism should be considered a public good. If this is true, traditional startups will have trouble disrupting anything due to their market-first orientation. There could be some business model innovation that could work, or maybe a SocEnt solution. It might come down to [shudder] consumer education and teaching people to pay for valuable things. I don’t know the answer, but this is a sector that I am deeply interested in and hope we get a solution soon.